As I’ve mentioned before, writing a gift guide for kids is always a scary thing, because before the CGG ever existed, ‘hot toy’ lists were being released all over the place. So instead of trying to hone in on the top 10 hottest toys, I’m identifying 10 unique gift ideas for tiny tots, kids, and tweens alike. Enjoy! I featured RedHeartMonkeys on my blog earlier this year and a bunch of you agreed it was a super cute and customizable gift idea! 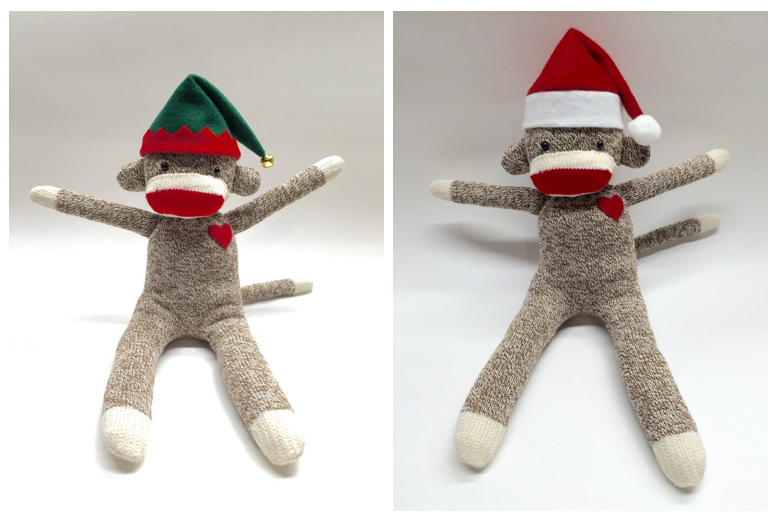 Well the brand has whipped up something new for the holidays – two festively appareled sock monkey plush toys. Available in both a Santa and elf variety, this adorable classic toys have a few different ways to customize them. First, choose your sock colour and whether or not you want your sock monkey to have eyelashes or not. Second, choose what letter you want on the monkey’s heart so each little one in your household can truly claim their monkey as their own. It’s a totally classic gift idea that still feels refreshingly simple this holiday season! When I was little, my parents instilled in me a desire to see the world – but I’ll admit, Little Passports might do an even more incredible job than they did! This unique subscription service for children delivers fun activities and collectibles to your doorstep each month, guided along by different characters that take you to different locations around the globe. It’s available in three different models. For the littlest ones, there’s Early Explorers, which kicks off with the delivery of a whimsical suitcase packed with goodies. Once they’re older, they can graduate to the World Edition, geared toward 6-10 year olds with more advanced challenges and games. If you’re keen on having them know our neighbours to the south, there’s also a USA edition that covers two U.S. states per month. All in all it’s a gift that’ll keep on giving – not just as a month-to-month subscription, but for building a desire to know the world in the next generation. Is there a budding artist in the house? This crafty collection of art supplies has every pencil, pen, and other implement a child would need to create incredible pictures. The sturdy aluminum case keeps everything neat and organized, and even folds up to create an easel for creating time. 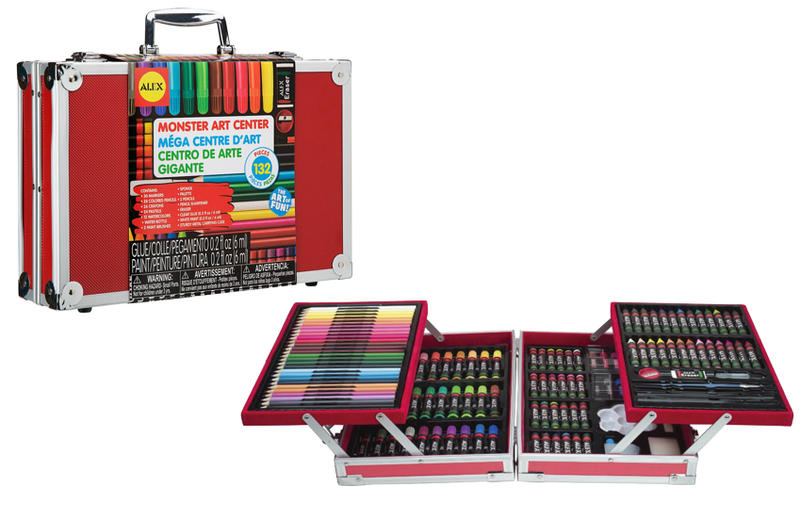 With paints, pencil crayons, markers, pastels, glue, drawing pencils, brushes and more, it’s a pretty comprehensive kit for that pint-sized Picasso. With a new niece in my family, I’ve been keeping a keen eye out for unique baby toys, and Hasbro’s definitely took the cake! Why you ask? Well as any mom can attest, having a few toys in your tote (or diaper) bag is essential to turning baby frowns upside down. So they’ve launched a line of impressive foldable toys that squeeze into tight spaces but can be easily and quickly expanded on to engage the little ones. Take for example, the Playskool Fold ‘n Go Busy Elephant, which is soft enough for baby to lie down on its tummy, but compact enough that it can easily be folded up and tucked into your bag once playtime is over. It’s also machine washable and has a whopping 7 activities to keep your tots busy. 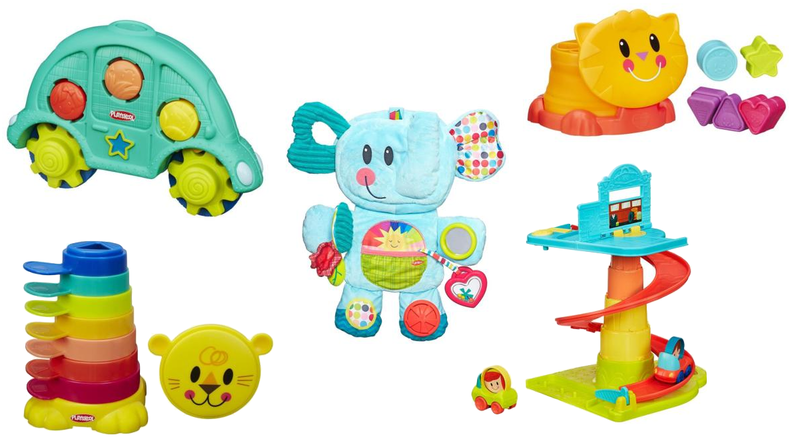 And that’s just one of many portable toys that Playskool offers – the Stack n’ Stow Cups, Roll ‘n Gears, Pop-Up Shape Sorter and Pop-Up Rollin Ramp are all super affordable ways to keep the kids entertained at every age and the parents totally sane. An amazing gift idea for all the little ones on your list! It was only a matter of time I suppose! Home Alone has officially cemented itself into the Christmas traditions of many (myself included – it’s an annual watch!) and now that tradition is being taken a step further, with the introduction of a sweet illustrated storybook version of the film. Whether you’re familiar with the story or not, the book features whimsical illustrations that capture the hijinks and energy of the film, captivating kids and the parents that read it to them. Plus it’s got some sweet life lessons about the value of family and Kevin’s impressive bout of bravery. With the introduction of the book, Home Alone is sure to join hallowed Christmas reading material like The Polar Express and How The Grinch Stole Christmas! If it feels like there’s been a lot of Star Wars on the CGG lately, that’s simply cause there’s a LOT of Star Wars stuff out there. But I was particularly intrigued by the latest and greatest incarnation of Disney Infinity, the interactive video game system that allows kids to mix and match their favourite characters from Disney, Pixar, and now Star Wars films to complete missions and stories in familiar settings. With the option to either create your own worlds using their Toy Box feature or following stories in their various Play Sets (including free stories available online), the Disney universe truly becomes a small world after all. I’m a big advocate of getting kids in touch with nature – but I also recognize in a climate like Canada, that’s not always the most feasible. Luckily, there’s Dunecraft, which specializes in indoor gardening kits, like these fun terrariums for kids. 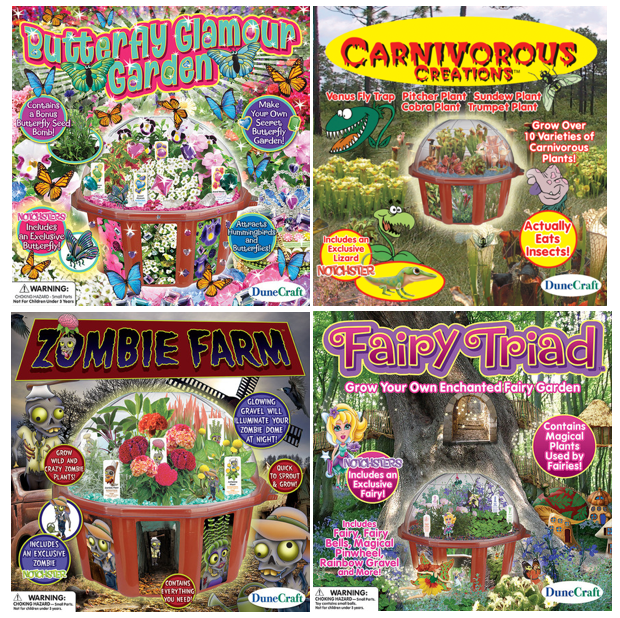 Available in a range of themes like ‘Dinosaur Dome’ and ‘Butterfly Glamour Garden’, each kit is designed for beginner gardeners to easily plant, nurture, and customize their little indoor paradises. The kits range from edible plants to ones with unique features, like the creepy cool ‘Carnivorous Creations’, featuring famed meat-eating plants like Venus Fly Trap. It’s a fantastic unisex gift that keeps on delivering rewards well after its been planted, plus it may inspire some help with the yard work come springtime. Given you can nab Dunecraft’s terrariums at major Canadian retailers like Indigo, it also makes a great last-minute pick. I *love* this subscription gift idea for a few reasons. First, it’s geared toward the often overlooked tween demographic of 8-12 year olds – children that typical ‘gifts for kids’ lists overlook and ‘gifts for teens’ lists are too mature for. Second, it’s a cool way to keep the kids engaged and busy with a wide range of items and themes and each and every month. With slightly different boxes geared toward boys and girls, each kit contains everything from fun wearables to cool knick knacks and toys to things they can actually interact with – the sample kits I checked out had a cupcake mould and a vanilla cupcake recipe, for example. It’s a great, creative idea that’s sure to feel fresh months after it’s gifted! Toward the end of his life, Steve Jobs reflected on the fact he really wanted to ‘disrupt’ the education system with more tech integration. While he may not have lived to realize that dream, the folks behind products like Osmo are certainly stepping up to the plate. This unique device turns your iPad into a sneaky little educational game that the kids will love to interact with. Basically you plop your iPad into a base and add a reflector to the top of it. Together, they create a ‘playing field’ where what your child does in real life reflects what’s happening on the screen. There are a few different apps and activities with the starter kit, such as the tracing app you see above that allows kids to turn any photo into a traceable / colourable image in real life. Or Tangram, which challenges their spatial intelligence to make puzzles that mirror what they see on screen. Finally there is Words, which is basically a spelling challenge using hints and alphabet tiles. Not only are the games fun on their own, they can be adapted to match your child’s schooling – if they’ve got a list of words to learn or spell, input them into Words and make learning them fun. The iPad has never been such a brain charger! There’s been a number of studies done out there that prove ‘building’ toys are great for children’s development. Bloco is a Canadian outfit who offers a unique take on the typical plastic block builder toy – their pieces are made of foam and can be linked up, stacked, and rotated in an endless number of configurations, creating movable, lovable toys your kids have made themselves. While each of their kits can be used to create its intended shapes – from dragons and ponies to spaceships and trolls – you can also have fun reinventing them into all kinds of different designs. This holiday season their newest offerings include a fun space-themed kit (perfect for any child that recently watched The Martian) which can actually be reworked into three different configurations, as well as a set for crafting two movable ponies, along with their accessories. If your kid loves one of these sets this year, you can be certain there are many more to come in Bloco’s future and many more easy-to-buy gifts too! Their products are available at a ton of independent and mainstream toy retailers, including Amazon.ca and Indigo. 1) First & foremost: you must be a subscriber to the Canadian Gift Guide to enter this giveaway. It’s as simple as finding ‘The Gift of Gab’ box in the righthand column and dropping in your email or clicking follow. Then leave me a comment below by November 21, 2015 telling me what product you love the most in this holiday gift guide. 2) Entries are limited to one per person / per email address / per household (or more if you score bonus entries). A random draw will be conducted on or around November 22, 2015 to select the winner, who will have 48 hours to respond before another winner is chosen in their place. 4) Bonus Entries: Do as many or as few of these as you’d like! Whatever you do, be sure to leave proof of your efforts in separate comments below – i.e. I’m looking for links. If you’re unsure how to link to a Tweet or Facebook post, do a quick Google search! RedHeartMonkey – Follow the brand on Twitter and Tweet about the giveaway, linking back to this post. Please tag @cdngiftguide too! Little Passports – Follow the brand on Pinterest and repin one of their pins. Hasbro – Follow the brand on Twitter and Tweet about the giveaway, linking back to this post. Please tag @cdngiftguide too! Random House of Canada – Follow the brand on Twitter and Tweet about the giveaway, linking back to this post. Please tag @cdngiftguide too! Dunecraft – Pin the image of the Dunecraft Terrariums from this post to your own Pinterest account. Whimsy Mail & Putter Pails – Like the brand on Facebook and leave a message on their wall about what you love best about this cool subscription idea. You’re under no obligation to mention my blog. Indigo – Follow the brand on Twitter and Tweet about the giveaway, linking back to this post. Please tag @cdngiftguide too! BlocoToys – Like the brand on Facebook and leave a message on their wall about which of their toys you think is the coolest. You’re under no obligation to mention my blog. LOVE LOVE LOVE The Home Alone book and I know my son would ADORE it!! Thanks. I am a subscriber! Following on twitter. Here is the link to my first tweet! I really like the Dunecraft Dome Terrariums and the Home Alone book. I really like the dune terrariums. My daughter loves gardening. I really like the dunecraft terrariums. My daughter loves gardening. I know that my grandson would love the Dunecraft Dome Terrariums. I like gifts that encourage my granddaughter’s involvement, so the Osmo and the terrariums would be my favs. Sock monkeys- one of my sons favourite cuddlers. Cute and timeless! I am very intrigued by the Little Passports idea. My kids love drawing and colouring so the ALEX Toys Young Artist Studio Monster Art Centre is my gift, ‘tho they’re all great ideas!! Thank you. The sock monkeys are adorable but i really like the terrariums. What a great gift that would be. I love the Bloco toys and the sock monkey. I like the Dunecraft’s terrariums. I think they would make a wonderful gift for a little person. I love the Dunecraft Dome Terrariums …so cute !! I love the little passports world edition and think it would be a great gift to my brothers . I love the Monster Art Center! I love the Dunecraft Terraniums. Osmo starter kit – my kids woul love most of these toys, great list. I love the dome terrariums. Such a neat idea for kids, my daughter would love that! I’m a subscriber. I think the ALEX Toys Young Artist Studio Monster Art Centre would be a perfect gift for my oldest daughter. I want to get them a Little Passports subscription as well. I like the terrarium kits. the ALEX Toys Young Artist Studio Monster Art Centre is a great learning tool as well as fun. I love the Dunecraft Dome Terrariums! The young artists monster art centre. If the power fails on a snow day you can still use this on a winter day. I love the Whimsy Mail and Putter Pails the most. Such a great idea. I think I’d even enjoy it although I’m not a teen! The product I love the most is the monster art studio! Thanks! The gift I like the most is the RedHeartSock Monkey as it is adorable and good for any child thank you. Love the BlocoToys Galactic Mission and The Ponys Collections! With all the budding artists in my family, the Monster Art Centre would be well loved. We’ve been wanting to play Disney Infinity 3.0 here, so that’s my top choice. With Their Eyes All Aglow https://t.co/50m3mbkET1 via @cdngiftguide. 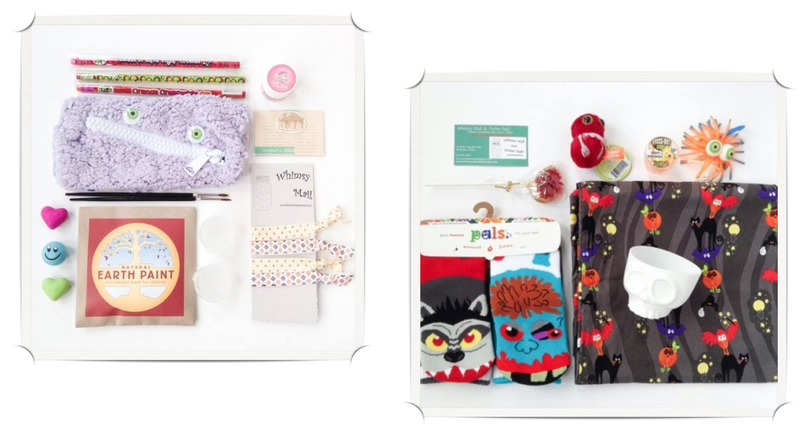 Holiday giveaway featuring @RedHeartMonkeys from @cdngiftguide! With Their Eyes All Aglow https://t.co/50m3mbkET1 via @cdngiftguide. Holiday gift guide featuring @HasbroNews from @cdngiftguide – contest! 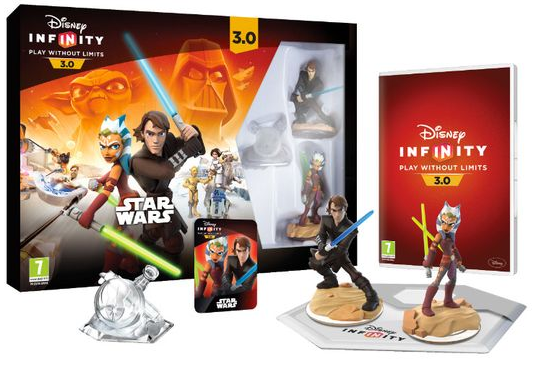 The Disney Infinity 3.0 Starter Packs is my favourite item in this gift guide. I think it’s a terrific gift. I’m a subscriber to your blog via email. Amazing giveaway happening over at https://t.co/HDAUEGFXTi thanks to @cdngiftguide and @RedHeartMonkeys Happy Holidays! I really like the RedHeartMonkeys sock monkey toy. Little Passports look like a great gift. https://www.pinterest.com/patterson1982/crafts/ I pinned the Little passports -Christmas igloo made from sugar cubes! I like the Little Passports subscription service for children – thanks! I love the Home Alone movies so I love the idea that it has been made into a book. I love the Dunecraft terrarium domes – my kids would really enjoy that! The Whimsy Mail & Putter Pails Subscriptions sound the best! I like the Monster Art Center the most. I like the 2 Dunecraft Dome Terrariums the most! I love the ALEX Toys Young Artist Studio Monster Art Center. What a great set and it can all stay so organized! I love the Dunecraft Dome Terrariums, especially the Zombie Farm & Carnivorous Creations! I like the Dunecraft Dome Terrariums the best. my granddaughter would love the Osmo Starter Kit. I am a subscriber! TY! I like the Dunecraft Dome Terrariums! i think my son would love it! Thanks! My 6 year old daughter would be above and beyond delighted to find a monster art center under the Christmas tree, as well as the gardening kits. Where my 1 and a 1/2 year old son would have the biggest brightest twinkling eyes if he saw the playschool toys and sock monkey. Personally my eyes would be aglow with absolute gratitude. ALEX Toys Young Artist Studio Monster Art Center – $87 @ Amazon.ca – My daughter would go crazy over this. My nephews would love to use the ALEX Toys Young Artist Studio Monster Art Center when they come to visit. I love the ALEX Toys Young Artist Studio Monster Art Center. My kids would love that. With Their Eyes All Aglow https://t.co/50m3mbkET1 via @cdngiftguide. Featuring @RandomHouseCA, an awesome giveaway from @cdngiftguide! I like the Dunecraft terrariums, because they are very unique. My children have never planted indoors before, so it looks like a fun activity for them to do over the winter. I really like the sock monkey. 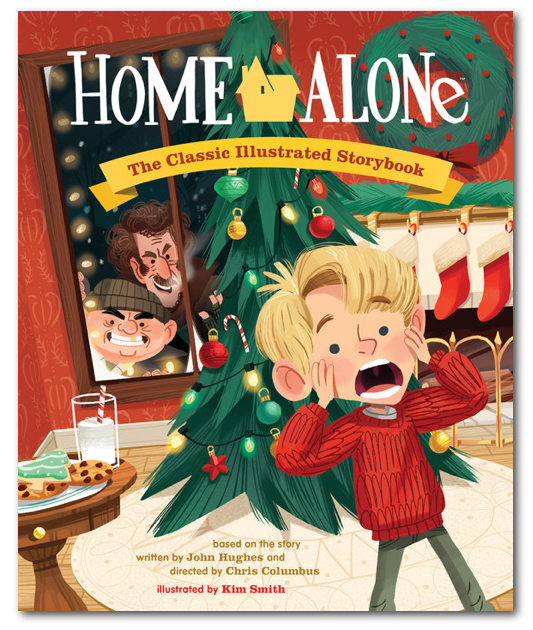 The Home Alone storybook is an adorable gift idea! I can see it becoming one of those classic Christmas stories you read with the kids every year. I am a subscriber. My favourite is the Osmo Starter Kit. My little grandson who is 3 1/2 would LOVE The Blaco Toys Galactic Mission. I haven’t seen this toy before. He loves space ships so this would be perfect 🙂 Thank you !! I absolutely love the Little Passports World Edition! What a great way to inspire a love for travel. I love the Whimsy Mail & Putter Pails! Even as an adult, I still get so excited every time I get mail that isn’t a bill and it’s even more of a thrill for kids! My favourite is little passports. https://twitter.com/alishaadil/status/664911024470949888 I tweeted Random House of Canada. My favorite would have to be the Osmo Starter Kit! Very cool and my boys would love it! The Home Alone storybook is my favourite. Love those movies! I loved the sockmonkey—I also subscribe! The Osmo starter kit looks awesome! I would love to give that to my 6 y/o girl, she would flip! 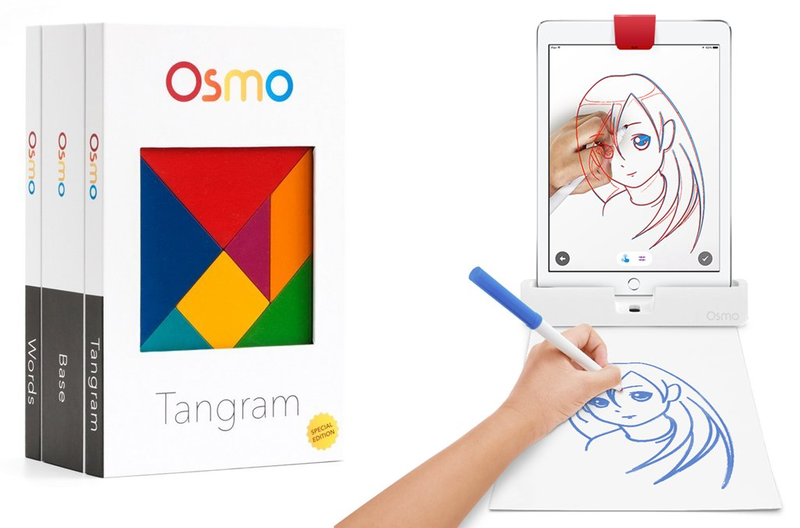 My favorite is the Osmo starter kit – a wonderful gift for a child. I am a subscriber. I like the A RedHeartMonkey plush. The Monster Art Set would be put to good use at our house. I think the Monster Art Centre is awesome. That would keep the kids (and adults) busy for hours. My favorite toys are the Playskool Baby Toys. They would be great for my new grandchild due in February. The young artist studio art kit looks great! would love the home alone book. Classic movie for the holidays. The BlocoToys Galactic Mission and The Ponys Collections are unique and would bring hours of fun I’m sure! Dunecraft’s Dome terrariums are so cute and are ideal for my lil gardener. She would be thrilled to grow a fairy or butterfly garden. The glowing rocks and little accessories provide extra fun. The carnivorous bug eating plants might trap fruit flies and other insects. Think the little passports is such a cool idea! I love the ALEX Toys Young Artist Studio Monster Art Center the most; a great way to inspire creativity. My boys would love this! Thanks! I love the ALEX Toys Young Artist Studio Monster Art Centre; it looks like a perfect gift to inspire artistry and creativity. My boys would get hours of pleasure from it. Thanks! I think the Little Passports is a unique fun idea! I love the Osmo Starter Kit most! following Little Passports on pinterest and re-pinned this pin. Ack! I’m sorry, copied and pasted the wrong pinterest url. here’s the right one. I love the sock monkeys – I had one when I was little and loved it! The Red Heart Sock Monkeys would be cherished by my little grandson. As a kid I would have been over the moon were I to recieve the ALEX Toys – Young Artist Studio Monster Art Center but The Little Passports is a great idea too. I love the Young Artist set. Love the little passport idea. one every kid loves getting mail and two they get to learn something new every month. I love the Osmo Starter Kit. Great idea for keeping your kids motivated. my cousin would love the Osmo! The Dunecraft Dome Terrariums look like so interesting!! The Playskool Baby Toys are adorable. I would like these for my son. I love the sock monkeys, they would be a great addition to my collection! I’m also a subscription box addict and think Little Passports and Whimsy Mail are two of the better boxes available for kids. I love the Dunecraft’s terrariums so cool & an awesome gift! the gift I like most is the RedHeartMonkey plush 🙂 they’re all great prizes ! I love the ALEX Toys Young Artist Studio Monster Art Center the most. I’ve liked Whimsy Mail & Putter Pails on facebook and have left a comment on their wall. I am a subscriber. I most love the ALEX Toys Young Artist Studio Monster Art Center.